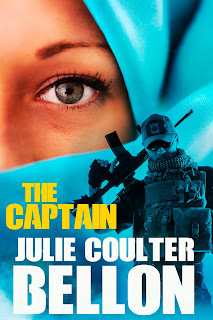 In May my romantic suspense, The Captain, was released. This novel received the Crowned Heart for Excellence from InD'Tale Magazine and got a really great review from Meridian Magazine that said it was a difficult book to put down. This book was nominated for a Whitney Award, too, so I was excited about that. In June, my novella, Forget Me Not (Hostage Negotiation Team #3.5) was released. It was fun to revisit my Hostage Negotiation team again. I sort of miss them! In November, my first romance novel, Love's Broken Road was released and so far the reviews have been wonderful. It was also nominated for a Whitney Award! Today I received a letter from a woman whose daughter had been in an abusive marriage and how much this book had touched them. I know I will keep that letter forever and I'm so glad she took the time to write to me! And last week I revealed the cover for my new novel coming in March, The Capture (Griffin Force #3). I'm so excited for this one! It's been a wonderful year for me and my writing and I'm so grateful to have the support of readers like you. I can't wait for 2017! In addition to The Capture, I'll also be releasing the second book in my romance series, and all of my novellas will finally be available in paperback! Hooray! So, at the end of this year and looking forward to the next, I'll throw some confetti and wish you all HAPPY NEW YEAR!! Can you believe all the great freebies we're getting this week? It's like Christmas every day for book lovers! Today I want to tell you about a boxed set freebie. 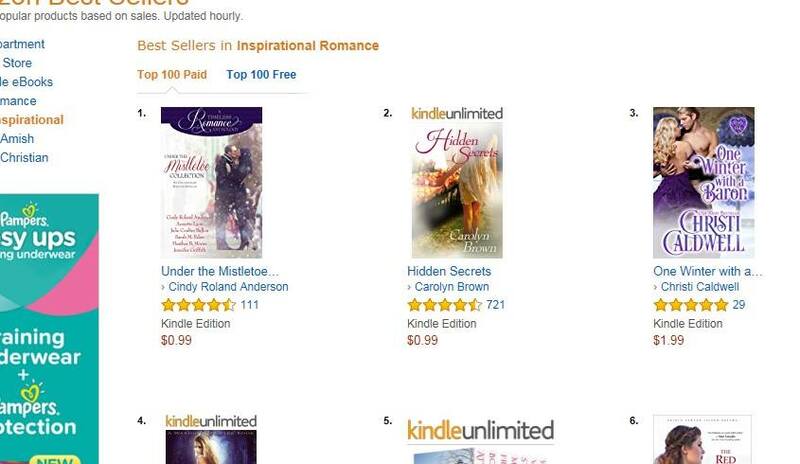 Karey White is offering all three of her Husband Maker romances for free! I really enjoyed all of these and I think you will, too. Gerald Lund is a master storyteller of historical fiction and his book, To Soar With Eagles, demonstrates his expertise. In this book, Mitch Westland and Edie Zimmer are trying to tame the land as they start their lives together in southeastern Utah. I love how Lund intertwines his fictional characters with the lives of real people. I feel like I know so much more history about the San Juan County area of Utah, but at the same time I was entertained and kept turning pages to see how it would all turn out for Mitch and Edie. They had to face so many challenges and heartache, I definitely wanted them to be able to have a family and a ranch to call their own. Their story jumps off the pages and Mitch and Edie were so realistically done it made you believe they really could have lived. Readers will feel like they've experienced the gamut of emotions right along with Mitch and Edie and are transported back in time as we find out whether they get their happy ending or not. And what a ride it is! The other thing I really enjoyed about this story was the notes at the end of the chapters. It was fascinating to read about the details from the actual accounts of the events included in the book. Since I've been spending all my free time this holiday season reading, I'm excited to tell you about another freebie! This time, it's an historical romance, The Stranger She Married by Donna Hatch. I haven't read this one, but it was recommended to me and it sounds good. Just in case you still needed one more book to make your Christmas complete, Prejudice Meets Pride by Rachael Anderson is free today! I really enjoyed this one and think you will, too. After years of pinching pennies and struggling to get through art school, Emma Makie’s hard work finally pays off with the offer of a dream job. But when tragedy strikes, she has no choice but to make a cross-country move to Colorado Springs to take temporary custody of her two nieces. She has no money, no job prospects, and no idea how to be a mother to two little girls, but she isn’t about to let that stop her. Nor is she about to accept the help of Kevin Grantham, her handsome neighbor, who seems to think she’s incapable of doing anything on her own. Prejudice Meets Pride is the story of a guy who thinks he has it all figured out and a girl who isn't afraid to show him that he doesn't. It’s about learning what it means to trust, figuring out how to give and to take, and realizing that not everyone gets to pick the person they fall in love with. Sometimes, love picks them. Cover Reveal for The Capture! I am SO EXCITED to show you the cover for my new novel, The Capture! It's the last book in my Griffin Force series and will be out in March. Isn't it amazing? I love it. My cover designer is incredible and really captured what I wanted the cover to say about this book. There's a lot of emotion packed into that cover, for sure. I can't stop looking at it! Yay! Today I got to witness something very special. My little girl's school class decided that instead of having a Christmas party, they would use donated funds and material to make fleece blankets for the residents of a care center who don't have families to visit them. The teacher had the kids do cutting and sewing and they worked really hard the last few weeks to get enough blankets made. They put up a little sign on their classroom that said, "Santa's Workshop" and they were all so excited to be making something to give to others. Today, the entire class walked over to the rest home and presented the blankets they'd made to the people there. Afterward, the children visited with the residents and sang Christmas carols for everyone in the home. Honestly, I could hardly hold back the tears with all the feelings of service and love in the room as those older ladies and gentlemen lit up with happiness as they interacted with the kids. As we all walked back to school, our hearts a little lighter and everyone wearing a smile, I couldn't help but think that my little girl's schoolteacher gave these children (and parents) a memory of service and of a sweet Christmas spirit that won't be forgotten. Cover Reveal for Heather B. Moore's New Book! 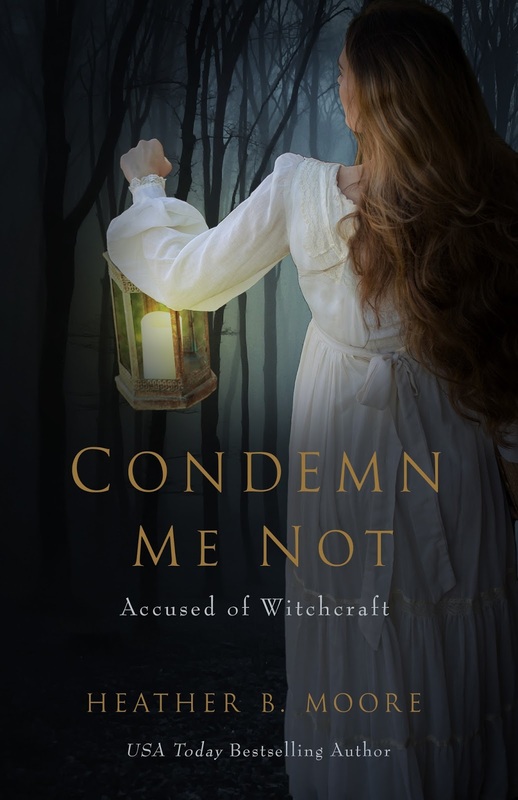 I am excited to announce the cover reveal of USA Today Bestselling Author Heather B. Moore's new novel CONDEMN ME NOT that will be out on March 14, 2017. I am so excited for this one! Isn't it creepily awesome? I can't wait to read it. Most Popular Author List & Two Free Books! 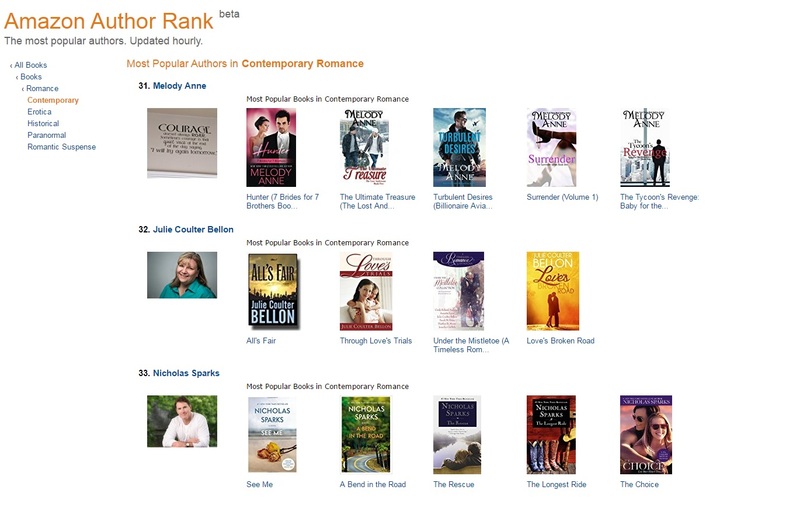 I was pretty excited this morning when I looked at the Most Popular Authors in Contemporary Romance list. I was #32, (which is awesome!) but look who is at #33! 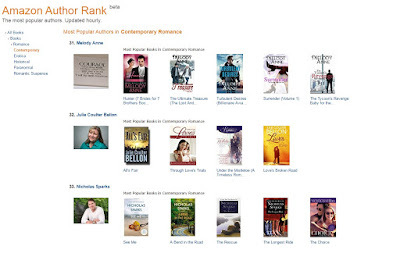 Just for today at least, I'm more popular than Nicholas Sparks! Woohoo! I also wanted to share two free books with you. Christy Barritt is offering her book, Random Acts of Murder for free and this mystery looks good! Janette Rallison is also offering her book, It's a Mall World After All, for free. She is a hilarious writer and I'm excited to read this one! If they gave out diplomas for what you learn at the mall, Charlotte could graduate with honors. Ever since she got a job as a perfume spritzer, she's become an expert on all things shopping related―oh, and she's getting really good at spying on her classmates who hang out there. What she hasn't mastered is the art of convincing her best friend Brianna to dump her boyfriend Bryant. After Charlotte caught him flirting with a mysterious, blond-haired stick figure, she knows he's up to no good. Worse still, now Brianna is taking his side. Charlotte must prove who is right, once and for all, and that means catching Bryant in the act. This is where her mall roaming skills will come in handy. Perfume anyone? I hope you're having a wonderful holiday season and find some time to read! Movie Review & A Bestseller List! The Christmas anthology, Under the Mistletoe Collection, that features six sweet romance novellas, including one from me, is perfect for a busy reader--short enough to read in one sitting, long enough to leave you with a smile on your face. The anthology is on sale today for only .99 cents, which is awesome, but it hit the Amazon Bestseller list today in both Inspirational Romance and Holiday Romance! Can we all just do a happy dance together? Thank you to everyone who bought the anthology and helped catapult it up the charts! Woohoo! 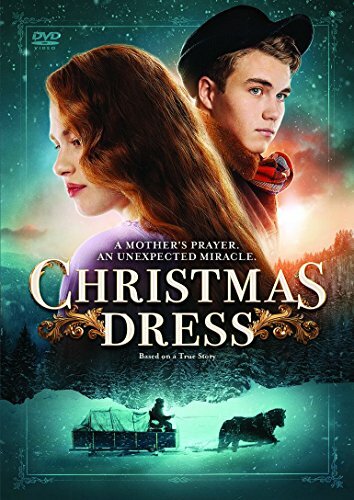 In addition to that great news, today I want to tell you about a new Christmas DVD called The Christmas Dress. It's a sweet movie that's only 27 minutes long, but uses the time to remind us of what Christmas is all about. We meet the Jeppson family who is struggling financially. It's the latter end of the 1920s and things are hard for everyone. Leland Jeppson can't find work, the packages he was expecting with his family's Christmas gifts hasn't arrived, and a snowstorm is blowing in. Leland's wife and children are at home, cooking up the last chicken and hoping for a Christmas miracle. But sometimes it's hard to have faith and hope in the face of adversity. George Schow, a postman who is nearly blind, doesn't seem to have much care about what happens to the Jeppson's and their packages. "God helps those who help themselves," he says. But when push comes to shove, will he help his fellow man and go the extra mile? I thought the actor who play the postman really stood out in his performance and the message was sweet and not overly preachy. My entire family enjoyed the show and we felt uplifted in the end. A quick Christmas pick-me-up about families and love and hope. It’s Christmas Eve, and Leland Jeppson’s hope is gone. Struggling to get by in their rustic homestead, he had at least wanted to give his family a special Christmas. But with a blizzard blowing in and the train bearing their gifts nowhere in sight, it seems Christmas is just one more thing they’ll have to do without. But as dusk falls, the Jeppsons’ packages unexpectedly arrive at the post office in the not-so-nearby town. Half-blind Postman George Schow is hesitant to brave the storm, but his son, Sidney, will stop at nothing to bring Christmas to the Jeppsons—and ask their daughter, Ellen, to the New Year’s Eve dance. Now it’s up to father and son to battle fierce elements in an attempt to deliver a Christmas miracle. Don’t miss this heartwarming reminder that while God helps those who help themselves, sometimes He does so through others. Today's Friday Freebie is a cute Christmas novella called Miss Kane's Christmas by Caroline Mickelson. I'm all ready to cuddle up by my fireplace and get some Christmas spirit! My Book Was Reviewed In Meridian Magazine! I'm so excited! My new romance novel, Love's Broken Road, had a wonderful review in Meridian Magazine this morning! A little early Christmas present to me. Woohoo! The best part of the whole thing was the reviewer, Jennie Hansen, calling my book one of her personal favorites. Yay! 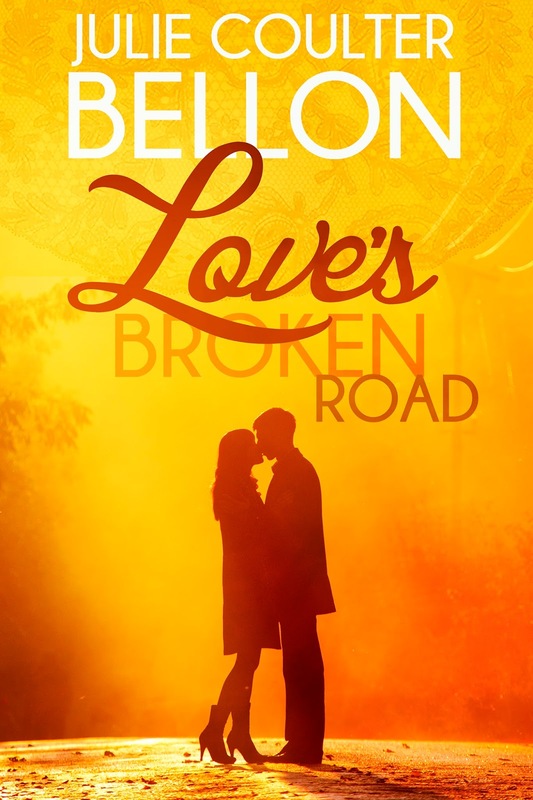 "Bellon usually writes action packed international intrigues, but with Love’s Broken Road she introduces a tender romance to her readers . . . This story is a second romance between two people who have suffered hurt and loss and are uncertain whether they can risk loving again. The characters are likable and draw the reader’s sympathy from the start . . ."
A few years back I contributed a story to an anthology about a time that was very tender for me---one of the most emotional Christmases I've ever had. It's a story that is very close to my heart and even though it was written a while ago, I've been re-reading it and remembering. There are several other good stories in the collection and if you're looking for a book to bring your heart closer to what's really important this season, then this is the book for you. 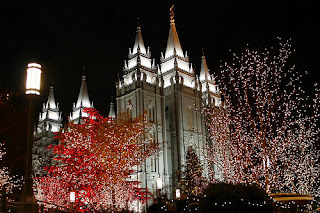 I took my kids to see the lights on Temple Square last weekend. It was so beautiful, but we didn't stay very long. My little boy couldn't concentrate on the beauty of the lights because he was cold. He kept saying his legs were like "icicles" and he "couldn't walk another step" and that was all he could focus on. Luckily Dad and big brother stepped up to carry him and when he was in their arms, he was warm enough to finally lift his head and see the amazing displays that surrounded us. Sometimes I think life is like that. When we are cold, or sad, or lonely, it's hard to see the beauty and blessings all around us. When we have a friend to carry us or listen to us or just be there for us, we start to feel the warmth of their love enough to lift our heads and see the loveliness that surrounds us. But, even more, when we ARE that friend, the one reaching out to help and carry and be there for others, then light and love shines from within us and warms everyone from the inside out, including ourselves. Most of all, though, helping someone else changes our focus and brings us closer to what's really important. So, today, I'm just feeling grateful for the people and all the light and love I've been blessed to have in my life and for the opportunities I've had to share it. And I'm hoping you're also feeling some light and love this Christmas season! Have you done anything that really lifted and inspired you so far this month? Four Free Books, A Giveaway, AND A Movie Release! It's like Christmas around here! I'm so excited to share four free books with you, a giveaway, and the movie release of The Last Descent. Be sure to scroll all the way down for the giveaway and deals! Then, Liz Isaacson is giving away the first three full-length novels in her Three Rivers Ranch series! I really enjoyed these stories and think you will, too. For fans of inspirational western romance authors Staci Stallings, Kimberly Krey, Becky Wade, and Denise Hunter. Third, Jennifer Peel is giving away her contemporary romance, Rachel Laine. I haven't read this one yet, but it looks good! There will also be a contest to win a copy. Be sure to check back! Today's Friday Freebie is a mystery romance, Diamond Rings Are Deadly Things, by Rachelle Christensen. I've really enjoyed her Wedding Planner series and I think you will, too. It's the perfect book to snuggle up with this weekend. 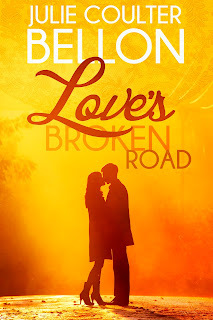 I was so happy to find some new review of Love's Broken Road. I wanted to share a few of my favorites. 1. 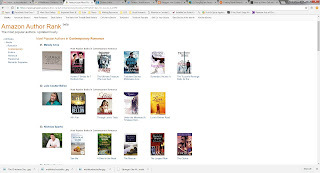 At Kindle and Me where the reviewer had taken the time to find pictures to go along with her review! It was a fun twist on the reviewing norms. "The story is about finding out who you are and overcoming grief and abuse and more importantly learning to love again." Thank you so much to Kelly! 2. At Joy In The Moments, Char said, "It melted my heart like ooey gooey cinnamon rolls, and was delicious for so many reasons—side characters and stories were riveting, the theme tugged at my heart, and the writing was great." I love cinnamon rolls! And I loved this review as well. 3. The last one was from Sheila at Why Not Because I Said So. My favorite line from her review was this one, "This romance will lift your heart, and restore your faith in the power of hope and love." Awww, thank you Sheila! I'm still so amazed and thrilled at the reception of this romance. I appreciate everyone who has read and reviewed it for me. Thank you! I've been reading The Timeless Romance Anthology Blind Date Collection. 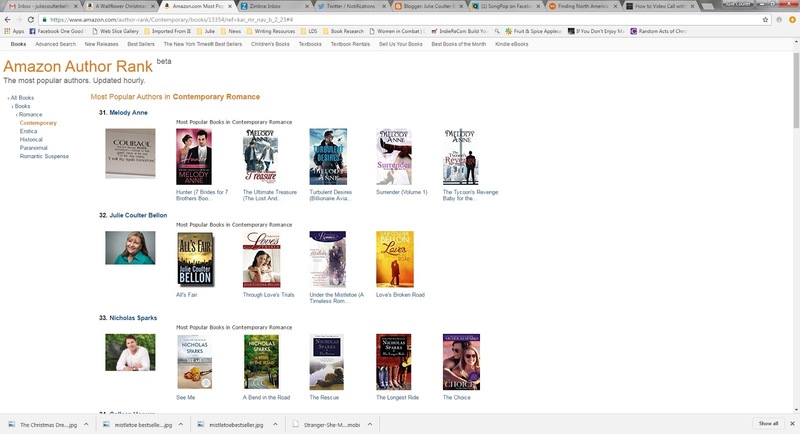 There are three historical novellas and three contemporary from some of my favorite authors! So far, the stories are captivating and I'm really enjoying the historicals. Romantic and sweet, with just enough to wake up the butterflies if you know what I mean. I'll let you know what I think of the contemporaries!